Heart, originally uploaded by indiaeden. Just a little bit of nesting, I've a way to go yet before I start getting truly nesty. This cupboard was given to me by a very dear friend several years ago. She sadly died four years ago from breast cancer, and I miss her still every day. I've always loved the cupboard,but after a bedroom move about, a couple of years ago I had nowhere for this cupboard to go, so I reluctantly put it in storage in the cellar, where it got rather grubby and sad. 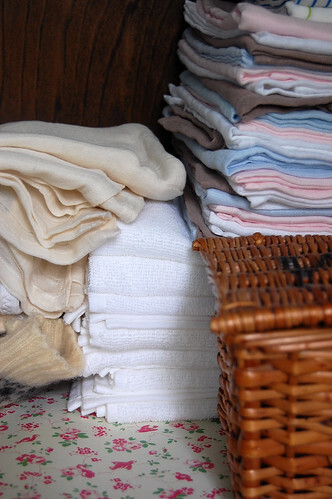 I think it was one of those nights when I couldn't sleep that I remembered the cupboard and thought it'd be great to store the baby's clothes and nappies. A good clean up, some glue in the joints ( and a bit of reinforcement here and there...thanks Woody! 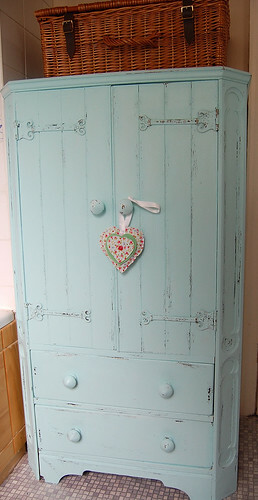 ), a couple of coats of paint, and a rub down with a wire brush, and I have a "shabby chic " style storage cupboard. 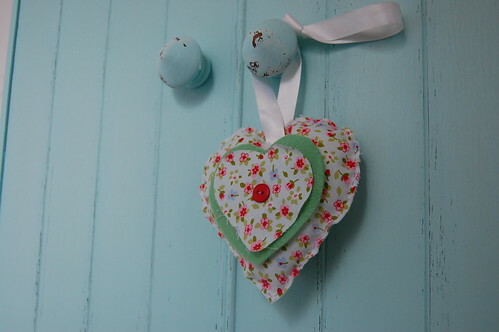 I added some Cath Kidston scented drawer liners, and this little hand sewn heart, : voila!! Perfect place to put all the baby things. Thank you to Anton, wherever you are honey! It looks beautiful and what a great way for your friends gift to be given new life.